The Tucson Homeskillet: The Tucson Homeskillet Breaks Down the Pizza Joints on Campbell Avenue from the "Meh" to the "Mmmm"
The Tucson Homeskillet Breaks Down the Pizza Joints on Campbell Avenue from the "Meh" to the "Mmmm"
Look we were going to do another article, one about a taco joint that is also part of a gas station, but the car's brakes are acting up and we didn't want to risk giving the rig any more problems since the place is a good half hour drive away and it is, sadly enough, beginning to show signs that it wants to go to the great carport in the sky. And speaking of sky, the day we had reserved for our newest food adventure turned out to be the time when a southward storm hit us and most roads were flooded, especially the ones leading toward the highway. So that was another "aww really?" moment. But we are not giving up! No, never! 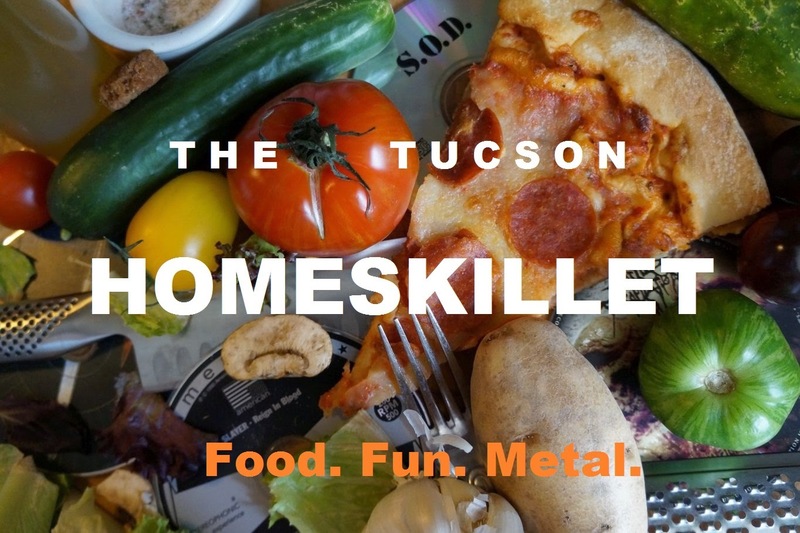 We can't let our readers and subscribers down (all, like 3/4's of you), so we went to the Tucson Homeskillet vault of backup plans and we came up with one that not only seemed like a lot of fun but was nearby and, yeah...well that was the main reason. For real, it was raining kinda hard (which explains the gray and damp photos), the car was rather wobbly but we had collected enough notes to do this piece right. So as many of you might know, the sweep of eateries on Campbell Avenue, midtown between Grant and Ft. Lowell, is sometimes known as "restaurant row". For real, you have Blue Willow, Pastiche, India Oven, Yoshimatsu (which is closed down right now due to relocating across the street from it's old place because in its stead we have...), Casa Valencia (which just opened up), a little Caribbean place (which we'll talk about later), Lovin' Spoonfuls and a ton of Mexican, fast casual and chain restaurants. Kinda like downtown but less hipster, the few blocks of Campbell holds a ton of upscale and quick bite options, most of which are quite tasty, but the one thing that we are focusing on here is the fact that seven similar yet completely different styles of restaurants are literally piled right on top of each other. We're talking pizza here kids. Yes. Pizza. With seven options on that tight length of road you have to be thinking sometimes, "Wait, which one...umm...should we go...uh...yeah...what's the difference between them all?" Big differences dear reader. Big differences. Let's get this opinionated list going shall we? Look, we're professionals here, we know what we are doing. Pretty obvious right? 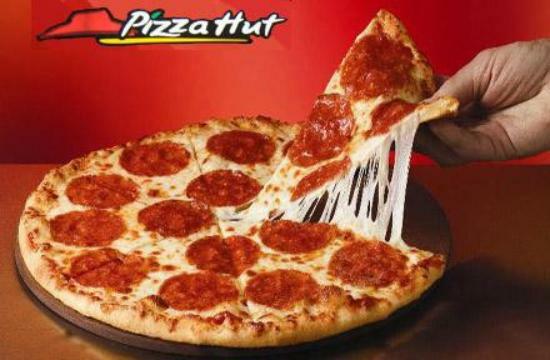 Us not digging on Pizza Hut when there are so many other amazing options nearby. Thing is, we are guilty of promoting the ways of the Hut. You might recall the time, like about a year ago, when the Homeskillet crew got together and ate a glut of their stuff crust pizzas, especially the hot dog option. So we have been there before, done that, had fun, but as far as the actual pizza product? 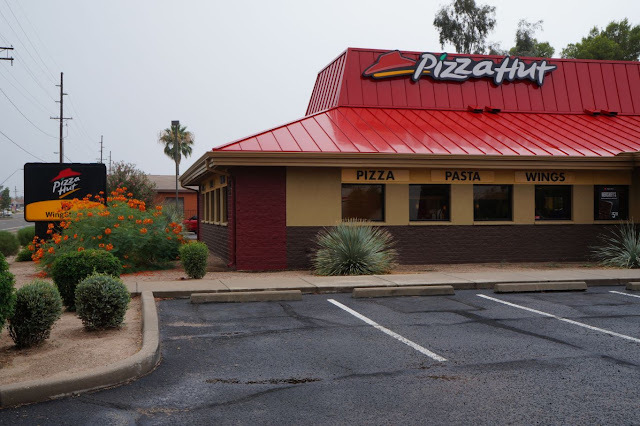 Look, Pizza Hut has been around since 1958 and it's gone through a bunch of changes since then. But you recognize it as a worldwide chain, over 15,000 locations, so you know the food you are getting isn't exactly locally sourced or close to being chef driven. It's good for kids birthday parties, for serving pasta in bread bowls, for late night delivery when the munchies get right on top of you. It's reliable, like a good ol' work boot...and that's exactly what Pizza Hut is, a good ol' work boot of a pizza chain. You know what you're going to get, you know it will be satisfactory, it's not that expensive and if there is a problem you know that all you have to do is politely lodge a complaint to the manager and they will give you like a "next one is on us" dealy. Unlike the thousands of other unsatisfied customers that yell at the underpaid staff members saying they didn't like the food (even though they pretty much ate it all) and demand that the whole thing be comped and the next one too. That's not how you do it folks. Be nice and understanding to the people that make and serve your food. Believe me. I have farted on many a dish because the customer was rude to the server or manager. Just be cool man. But the few times we have been in the Pizza Hut on Campbell Avenue it has been near deserted. Sure delivery is about 80% of their business but when you have amazing competition right across the street from you it's difficult to keep up. Thing is, Pizza Hut is what it is. If you like this place then, hey, it's right here waiting for you. No surprises. It's familiar, it's relatively safe and it wont break your bank. Although it might break your gut. For real...hot dog stuffed crust pizza and fettuccine alfredo served in a bread bowl? C'mon man. Can we be perfectly honest with you? We almost, kinda, put Hungry Howie's at #7. But we didn't! We didn't. Yet why would we in the first place, you might be asking yourself but not really because why would you when you're just skimming this list in the first place? 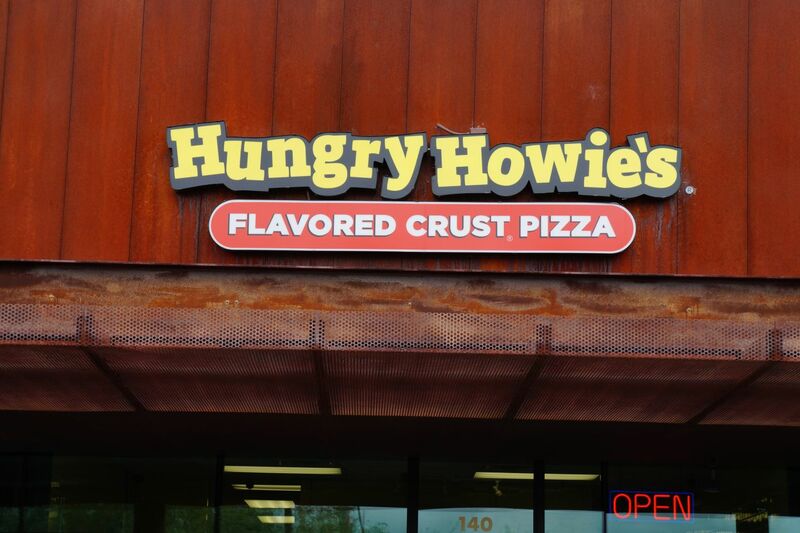 Hungry Howie's mails out more 2-4-1 deals than any other mildly digestible pizza place across town or has ads in local publications inviting you to buy one large pizza at the regular price and get the second one for a mere nickel. Something like that. How many late night beer-fests have we been privy to only to put in a couple of bucks for a HH's run? Hate to say it but...a few. Unfortunately they have a delivery charge but! you can go pick it up and save $3 (you can't even eat in there, you have to go out to the curb or something) but for not a lot of cash you and your buddies can eat acceptable pizzas and continue on with your drinking regalia. As have we experienced. Plus they have flavored crusts, like "Cajun", "ranch" and "garlic herb", that doesn't cost extra so occasionally you get a pal that really hasn't had authentic pizza but thinks the "sesame" crust choice is 'crazy awesome' and for that alone just seeing their beet red eyes light up just kind of warms you up inside. Oh yeah, the kids love Hungry Howie's too. Maybe it's the blonde kid smiling at you in the ads or on the pizza box. Maybe because HH's is a few steps up from that $5 pre-made "Pizza Pizza" slop. 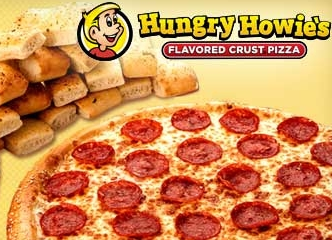 We'll take Hungry Howie's over that or anything Payton Manning endorses anytime. Look, the pizza at Hungry Howie's isn't bad but, it's not great....but we've eaten it. A few times. Alright, more than a few times. It's not sit down, like we said before, it's delivery (with a fee) or pick up only so if you're looking for a nice pizza place to go on a date you might wanna skip Hungry Howie's and go for the next four or five on the list. Unless your date likes "butter" crust and just wants to go back to the hotel room and watch a Toddlers and Tiaras marathon. Then...Hungry Howie's is the pizza option for you. You know, we've seen people eat in the store but...why? 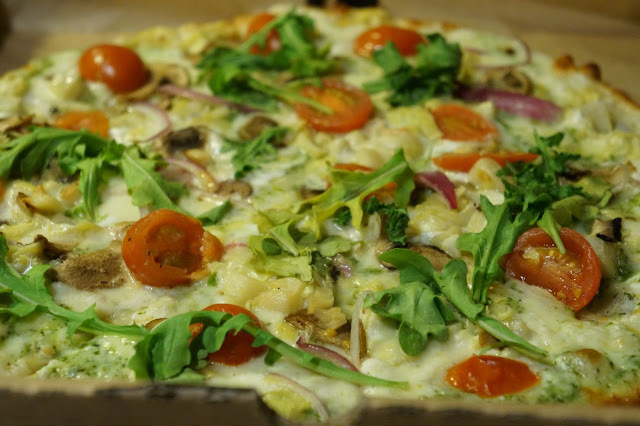 Blackjack is the ultimate in Campbell Avenue pizza delivery, and by "ultimate" we mean it's a decent pizza, for a decent price and we like the wings and their salads are actually kind of alright. Plus there is no delivery charge and we have never had to wait a long time to get our pizza. Which is why when the 11th hour of "what the heck are we doing for dinner" near argument happens we jump onto their website and do our worst. Blackjack is the kind of pizza joint you might see in some movie that takes place in a small Midwestern town, one that is oddly quiet and somehow misty and like a strange occurrence just happened so the visiting investigators talk to the local youths at the neighborhood pizza place so they all meet here, chat about the weird "happening" and then munch on slices that the cops bought them. "So did you know the kid who disappeared?" *mouth full of pizza* "Yeah." "So what was he like? Was he a good kid?" *shrugs, not making eye contact* "I dunno. He was alright." *cop smiles* "You like that pizza, huh?" *kid takes another bite, adjusts in his seat, nervous* "It's alright." Like we said, the wings are surprisingly tasty and their salads are generous for what you pay and the pizza is fair to middling. 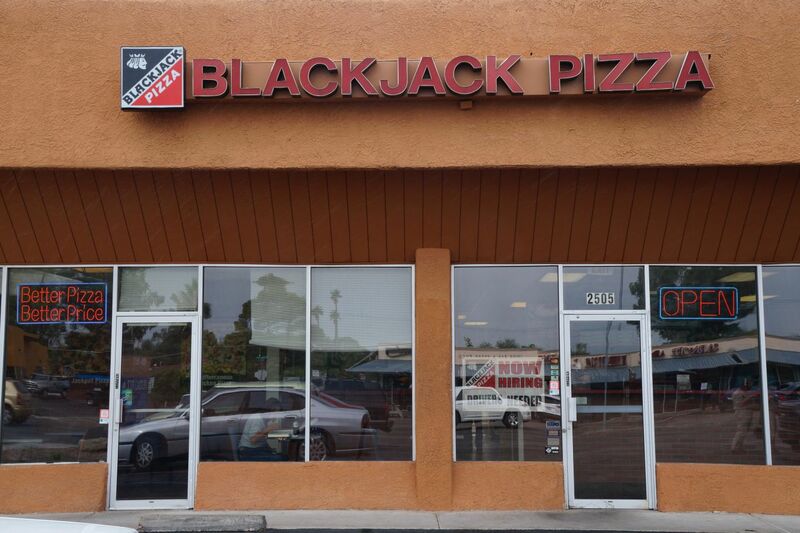 Apparently Blackjack is big in Colorado but there are only two here in Tucson and the one on Campbell holds the reign as top option for delivery. It beats the super corporate-ness of #7 and is a better product than #6, but as far as getting a tastebud blowing pizza experience you wont find it here. But...it's good. What are we saying, we eat this stuff all the time. You know why? Again with the coupons. Blackjack knows how to seduce us with a seeming deal don't they? Oh. Oh they do. And, you know, the pizza isn't bad. If you keep up with the Tucson Homeskillet at all you know that we did a piece on Pionic around this time time last year. We said that if they were smart and did it right this could be a very very lucrative business. Well, so far they seem to be doing okay but, unfortunately, another similar concept has moved in across town and seems to be stealing a bit of their thunder. Not that people are driving out of their way to get to the other place (or maybe they are) but we still think Pionic has a ways to go before they become a household name. On the bright side though...the pizza is getting better! When we first stepped in a bit after they opened their doors, we were met with a fresh faced and eager crew waiting to take our order and make our food. See, you pick everything that you want on the pizza, from the sauce, to the type of cheese to the toppings, and with a high powered and very hot oven you get your product in about 90 seconds. Sounded interesting, slightly tempting, and it sure works for that Chipotle thingy, sans the 90 second cook time. When we got the food we were agreeable with it although it lacked a bit of panache and flavor. Later, when we did the article, the food had improved but the staff had lost some of its, oh...shall we say, passion? The kid manning the dough area was rather distraught and sauce girl looked like she just got rejected for that college she wanted to get into. It seemed that after the initial "we're going to take over Campbell Avenue!" flourish subsided, the staff realized that they were working at just another pizza place and lost a bit of that of initial moxie. Recently we had some of their pizza and the pasta and, yeah, Pionic is starting to step it up. It feels as if they are hitting a stride of sorts; the sauce was tangier, the ratio of cheese to toppings was more thought out, although the pasta was still a bit tough...but we're not here to talk about that. It's the pizza that's the focus buddy! 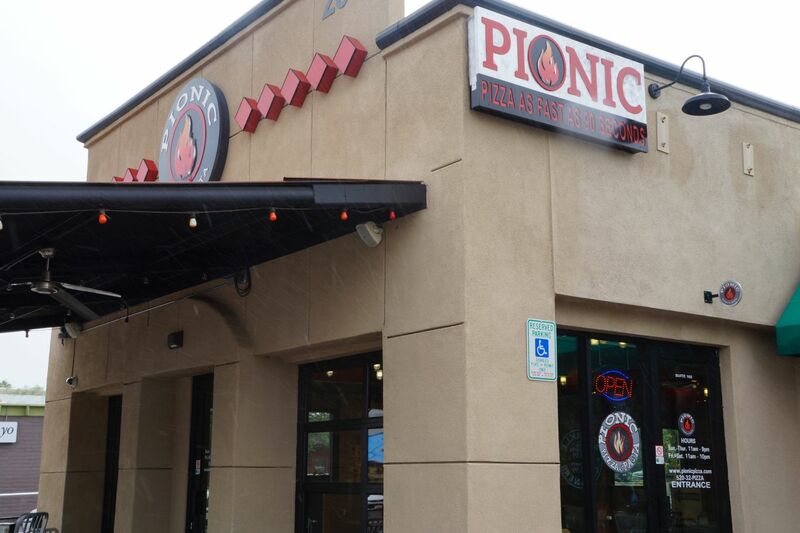 Best thing is that Pionic now delivers so folks in the immediate area have a sort of pizza Jimmy John's and we're sure (or at least hope so) that the owners of Pionic aren't out hunting elephants and lions, as the owner and CEO of JJ's does. And there's a JJ's on Campbell too! But screw them, Frankie's is right across the street and Pionic is right next door. Do yourself as favor: Don't support a-hole franchises that is run by a dude that gets his jollies off of bagging giraffes, give your business to places like Pionic because it's a better product, a better service and you wont put dough in the pocket of some mega-douchebag. Pionic is good and we think it keeps getting better. Best part is if you are in a hurry this is the place to go. And it's local so...there's always that. People swear by Sauce. Even folks that work in nearby pizza and pasta places do too. You know why we think it is? Its the mac n cheese. Oh yeah. We've had our fair share of that stuff and, for real, it is the best thing on the menu. In our humble opinion. But what about the pizza? We're here for the pizza! 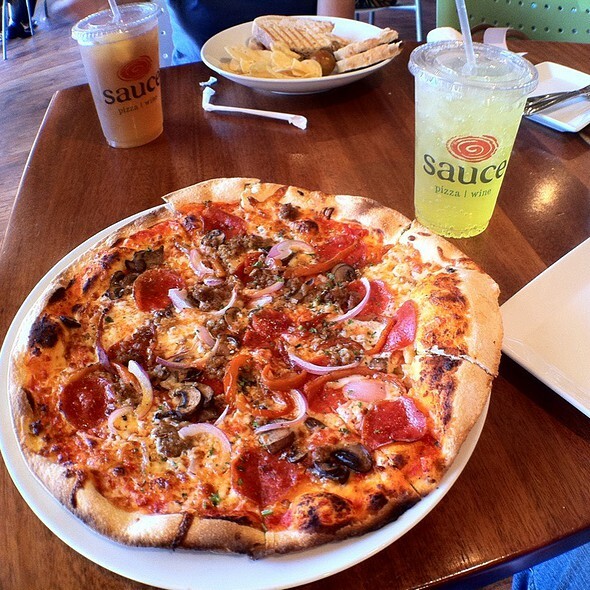 Sauce's pizza is good. Always has been and always will be. The crust is systematically on point and the ingredients are fresh and done correct. So why is Sauce #3 and not higher? For us its a bit too sterile and since we're not big wine drinkers there are other locations that provide full bar service and offer up an amazing beer selection. But...we'll get to that later. Sauce is the perfect Campbell Avenue spot to grab a lunch with friends that doesn't involve a billion flat screens playing sports or food that might slightly offend or even "challenge" you, which is oftentimes something you want when you're catching up with an old friend or chatting with co-workers on why management is such garbage. The food is good, the pizza is great but we like our pizza joints a little more comfortable, with some character along with a bit more danger involved. It's complicated. But when you've spent time in New York, Chicago, LA and San Francisco before eating widely in Tucson, the pizza places there serve up exquisite amazingness yet always have a sheen of 'you might get stabbed here'. And we like that. You wont get stabbed at Sauce. Oh the OC. What more can we say about you? You've been there for so long, made so many people happy, have like 110 beers on hand and, yes, employed Metal Mark as the pizza chef there for a few years. That's why Old Chicago is #2. We know what goes into the making of the pizzas; the time, the ingredients, the handmade dough...sure OC is a corporate run restaurant but it is the least "corporate-y" of the lot. 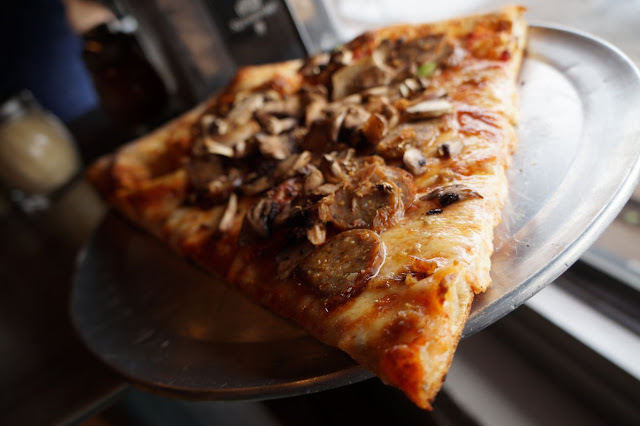 Best part is that Old Chicago is always bringing in new ideas and pizza concepts that oftentimes work, sometimes not, but at least they take that chance which is what we like and keeps us coming back for more. Their new 'ale crust' option is delightful and a great accompaniment to whatever toppings of pizza you prefer. This place has been in the neighborhood since the '90s and is still the go-to location to watch the game, get a craft beer, both local and from all over the globe, along with delectable pizzas that are always awesome. Here's the thing: Old Chicago, literally, has one of the best happy hour deals in town. Half off pizzas, $3 craft pints, dollar bites and so on which happens twice a day and that is something that you wont read about in some "Best of" list about Tucson. Just stop in to see what they have going on happy hour wise and see for yourself. For us, there is just too many good memories about Old Chicago. If the food was terrible and the company was crap and the staff was the worst then, yeah, we would have placed it far back on this list but...it's not. It's fun. It's kind of home. And, yes, it has one of the the best bartenders in town who has won recognition for her Bloody Mary's. Although we are being a bit biased because Metal Mark has been married to her for over ten years. 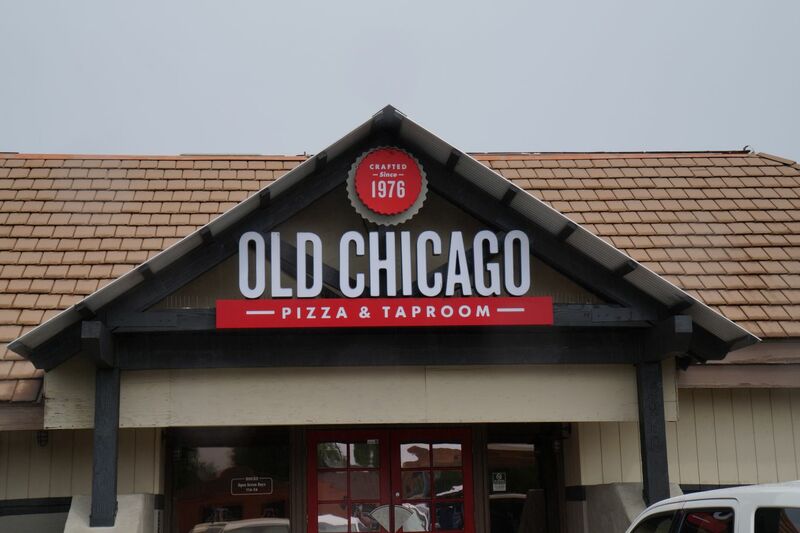 No, seriously, Old Chicago is great, a midtown Tucson institution, and for that alone we have to bow down and recognize the tradition it has given the locals over the years. That's something you really don't hear about except for locally owned places. 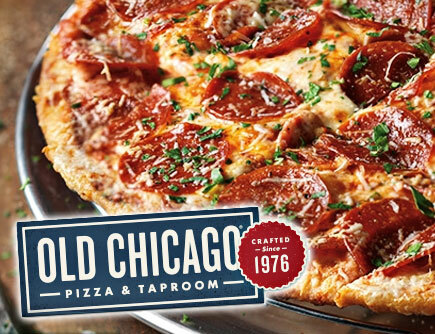 Old Chicago might be a chain but it's as local as you can get with corporate backing. Plus they have the World Beer Tour which basically means you get free stuff just for drinking beer. Umm...yes please! The pizzas though...so good. And we should know: We made them for five years. Upper Crust, in that neighborhood, just off of Campbell, right across the street from Bookman's, is hands down your go to destination for pizza here. Sure, some are going to protest this while others are just going to go "Well, duh! ", but let it be known that Upper Crust wins this round with ease. First off, let's get the obvious out of the way: Got it. Upper Crust is not "officially" on Campbell Avenue. It's really on Grant, but all you have to do is walk a few steps off of the main drag and you are there. 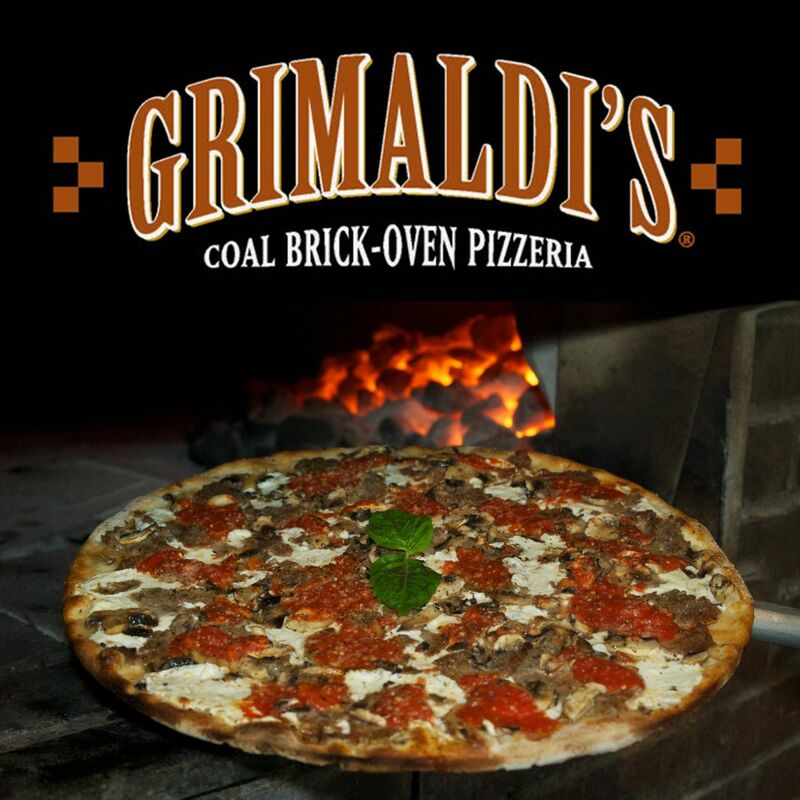 The pizza here is superb and we have never been disappointed with the service or product. Sure others in town might take the crown for 'most awesome slice' but on this stretch the honor goes to Upper Crust. And speaking of slices, their deal for $5 gets you a fountain drink along with a monster slice the size of your chest. For reals. We oftentimes have to grab a knife and separate it into three or four mini slices just to make sense of the whole thing. But it is always flavorful, cooked to perfection, loaded up just right and we have never left the place hungry. Yes. 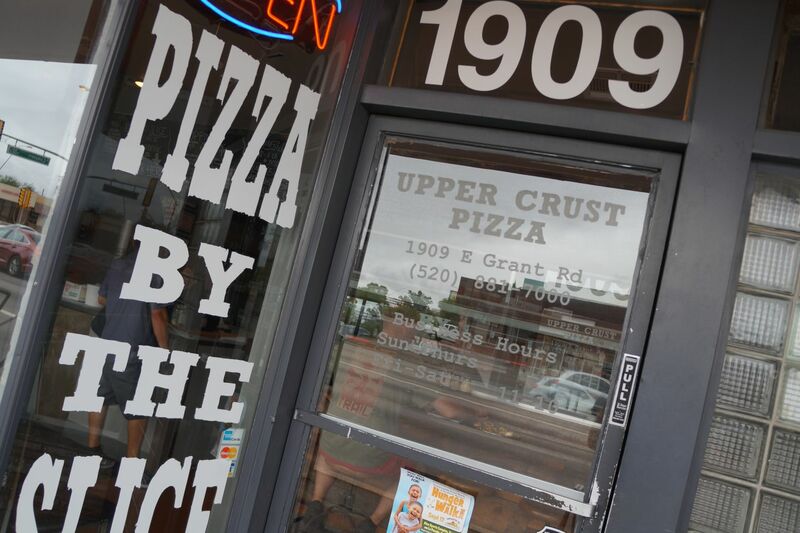 Upper Crust is a comfy spot to dig into some of the best pizza in Tucson. We love the window seats which offer up some free people watching entertainment as you dive into a masterful work of pizza perfection. So, speaking of dates, we think this would be a nice spot to take your person of interest to. It's fairly quiet, it has a good amount of tables and seats (now that they have expanded) and just funky and dark enough to make it a locale to get to know one another. Not to mention if your possible suitor doesn't like the food here then you can just straight dump their azz. Who doesn't like the pizza here? People that wanna get dumped, that's who. Okay, sometimes the delivery can take a while at times but, who cares? When you call at 9pm on a Saturday just when, oh...we don't know, everybody else in the immediate vicinity has the same idea you just might have to be patient. Pizza of this quality takes a bit of time so just chill, Netflix, crack open another tall cold one and just anticipate the awesome that is about to be dropped off at your front door. Isn't modern living grand? 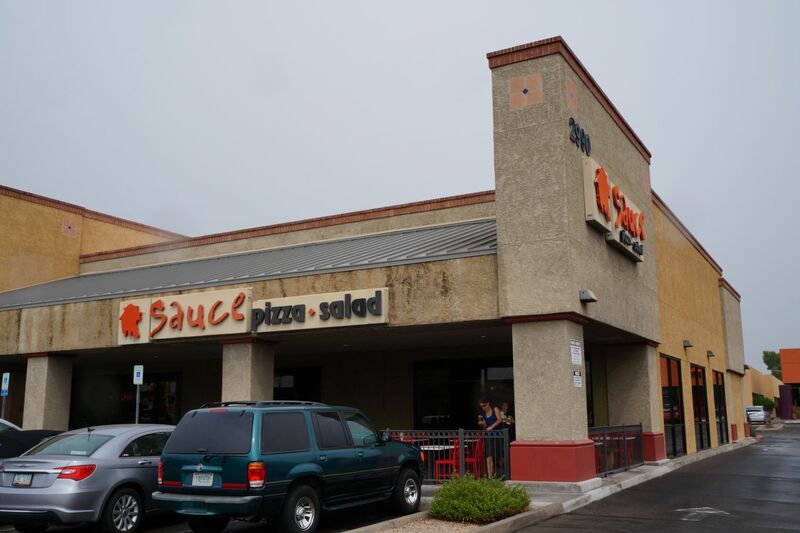 This is one of the few places in Tucson where we actually like to eat in house. Not too sure why. Maybe because it reminds us of past pizzarias in large metropolitan cities where the food is incredible, the space is neat and comfy but, because of the location, you just might get stabbed. But, really, you wont get stabbed at Upper Crust pizza. Well, we can't say you wont ever but it's most likely you'll just get shanked with a food baby. We always do. And we love it. Upper Crust pizza...you our only friend! In the midtown, Campbell Avenue area that is. And there you have it! Our top seven pizzarias on the Campbell Avenue restaurant row stretch. We hope this has been helpful and we are sorry if you totally disagree with us. Actually...no. We're not. We've done the time, done the research and if you want to compile a list of favorite places to eat in your neck of the woods, please do so. 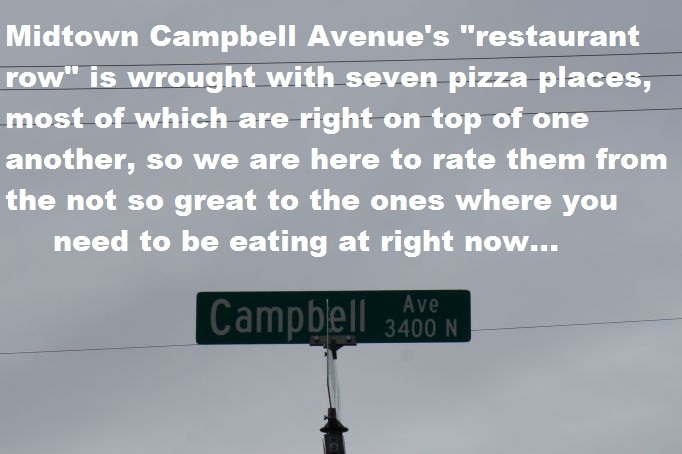 For now we are going to kick back, relax, and eat some amazing pizza off of Campbell Avenue. Although, just for karma sake, we have to list just one more place. Technically not a part of the Campbell Avenue restaurant collection but, still...Grimaldi's Brooklyn based brick oven pizzaria is on Campbell Avenue, near the University, a good half mile away from the stretch, and the pizza there rocks. Like seriously amazing. So we just wanted to give a shout to yet another pizza place on Campbell since Upper Crust really isn't, officially, on Campbell Avenue...technically. You know what we mean, right? I've been meaning to do a similar article. By my count there are 16 pizza shops between 6th St and Sunrise. That being said, I deplore all the national chains included. Better to add Tavolino and North. Tucson again. UPPER CRUST PIZZA! !